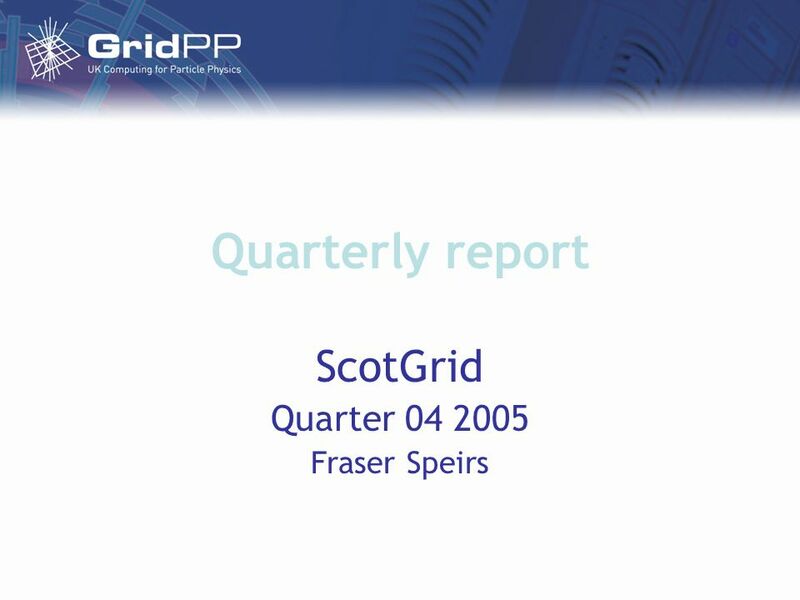 Quarterly report ScotGrid Quarter 04 2005 Fraser Speirs. 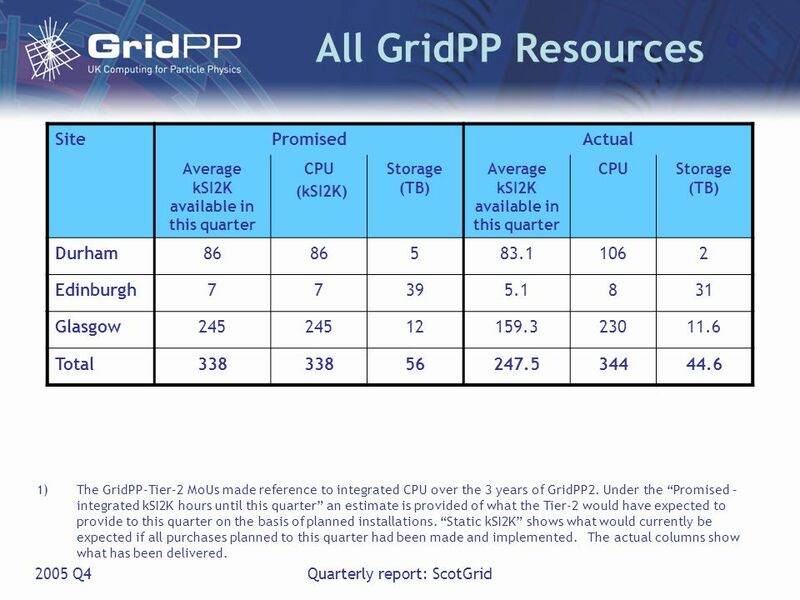 3 2005 Q4Quarterly report: ScotGrid All GridPP Resources SitePromisedActual Average kSI2K available in this quarter CPU (kSI2K) Storage (TB) Average kSI2K available in this quarter CPUStorage (TB) Durham86 583.11062 Edinburgh77395.1831 Glasgow245 12159.323011.6 Total338 56247.534444.6 1)The GridPP-Tier-2 MoUs made reference to integrated CPU over the 3 years of GridPP2. 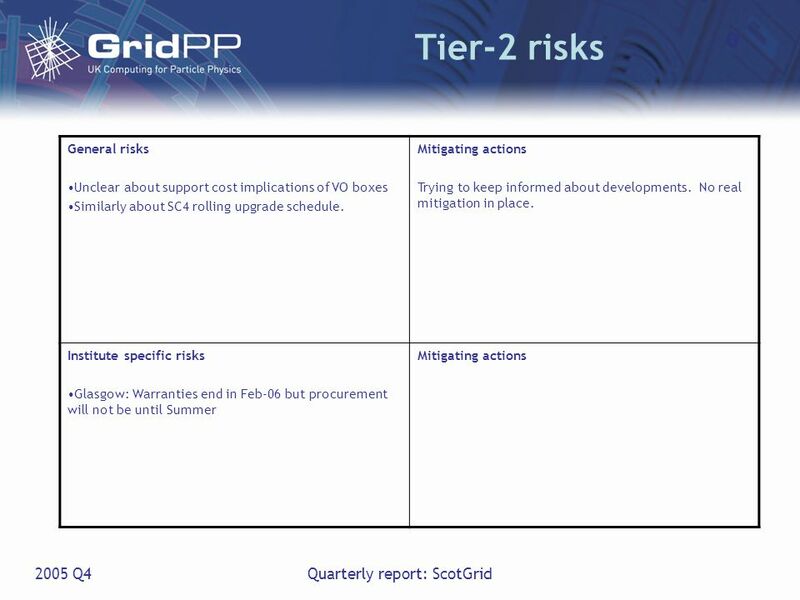 Under the “Promised – integrated kSI2K hours until this quarter” an estimate is provided of what the Tier-2 would have expected to provide to this quarter on the basis of planned installations. “Static kSI2K” shows what would currently be expected if all purchases planned to this quarter had been made and implemented. The actual columns show what has been delivered. 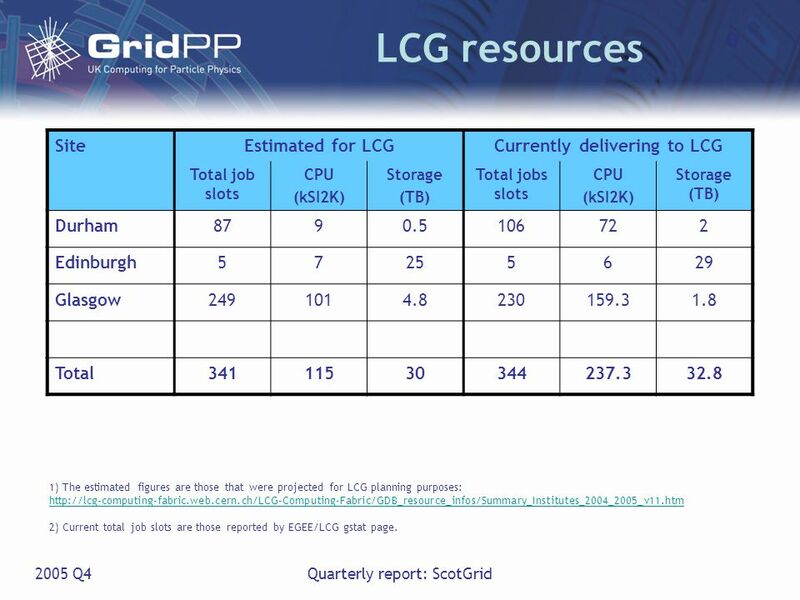 4 2005 Q4Quarterly report: ScotGrid LCG resources SiteEstimated for LCGCurrently delivering to LCG Total job slots CPU (kSI2K) Storage (TB) Total jobs slots CPU (kSI2K) Storage (TB) Durham8790.5106722 Edinburgh57255629 Glasgow2491014.8230159.31.8 Total34111530344237.332.8 1) The estimated figures are those that were projected for LCG planning purposes: http://lcg-computing-fabric.web.cern.ch/LCG-Computing-Fabric/GDB_resource_infos/Summary_Institutes_2004_2005_v11.htm 2) Current total job slots are those reported by EGEE/LCG gstat page. 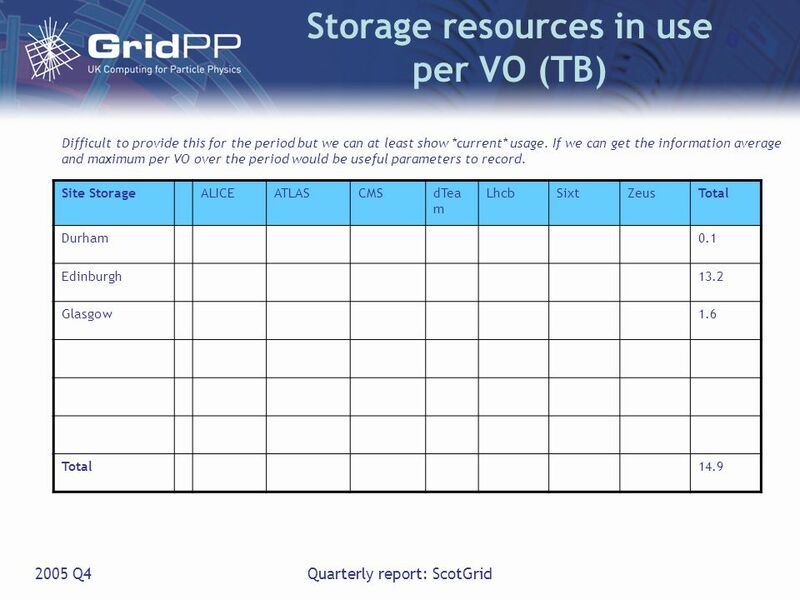 9 2005 Q4Quarterly report: ScotGrid Storage resources in use per VO (TB) Site StorageALICEATLASCMSdTea m LhcbSixtZeusTotal Durham0.1 Edinburgh13.2 Glasgow1.6 Total14.9 Difficult to provide this for the period but we can at least show *current* usage. 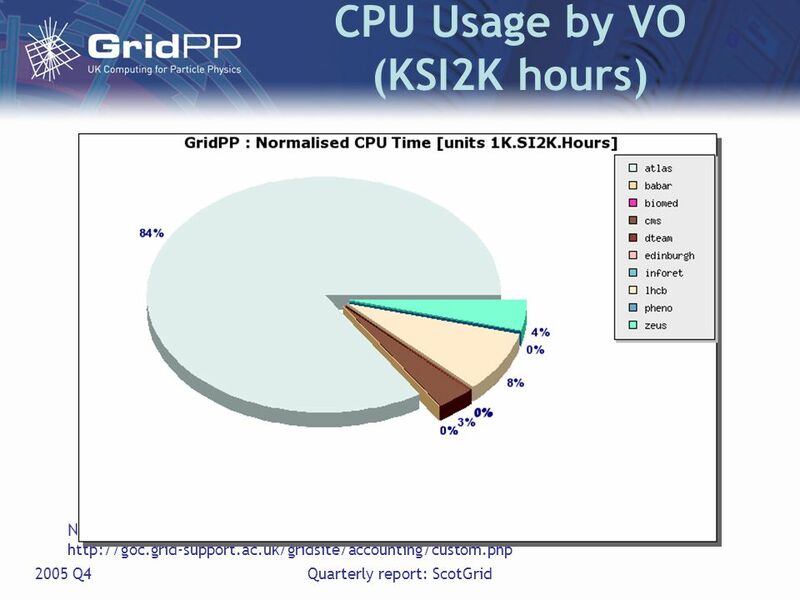 If we can get the information average and maximum per VO over the period would be useful parameters to record. 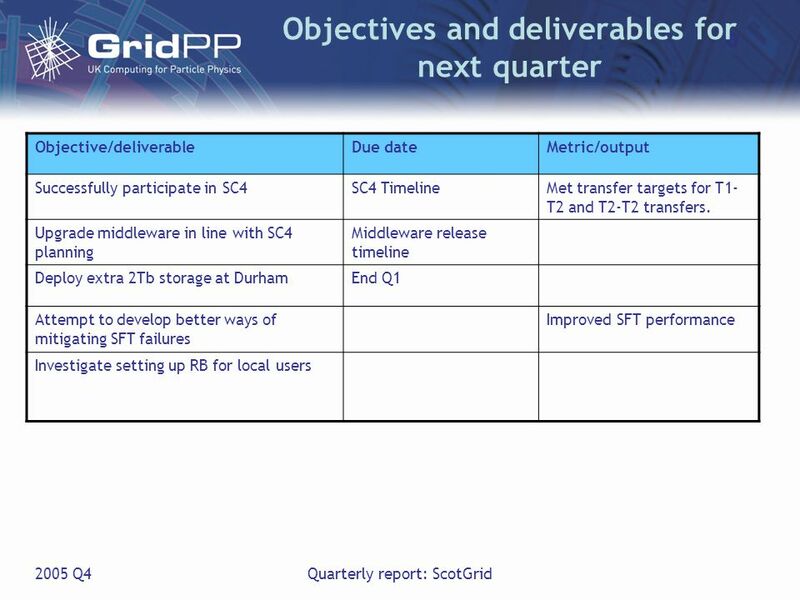 17 2005 Q4Quarterly report: ScotGrid Summary & outlook SRM has been a focus this quarter. 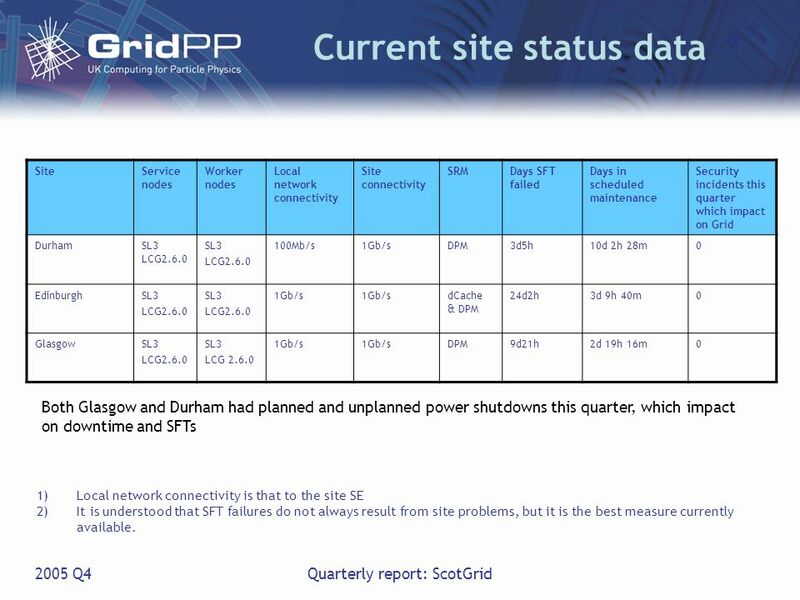 –All sites now with SRM Procurement work is ongoing at Glasgow, Edinburgh. 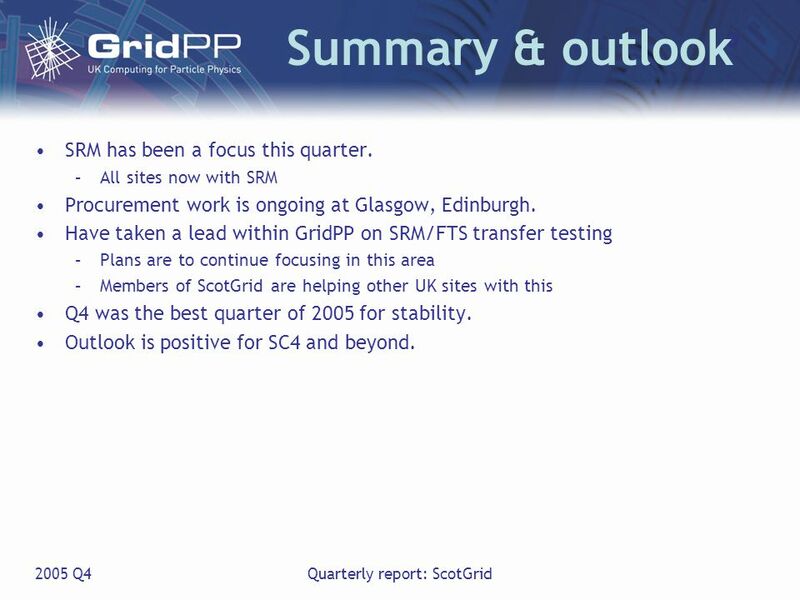 Have taken a lead within GridPP on SRM/FTS transfer testing –Plans are to continue focusing in this area –Members of ScotGrid are helping other UK sites with this Q4 was the best quarter of 2005 for stability. Outlook is positive for SC4 and beyond. 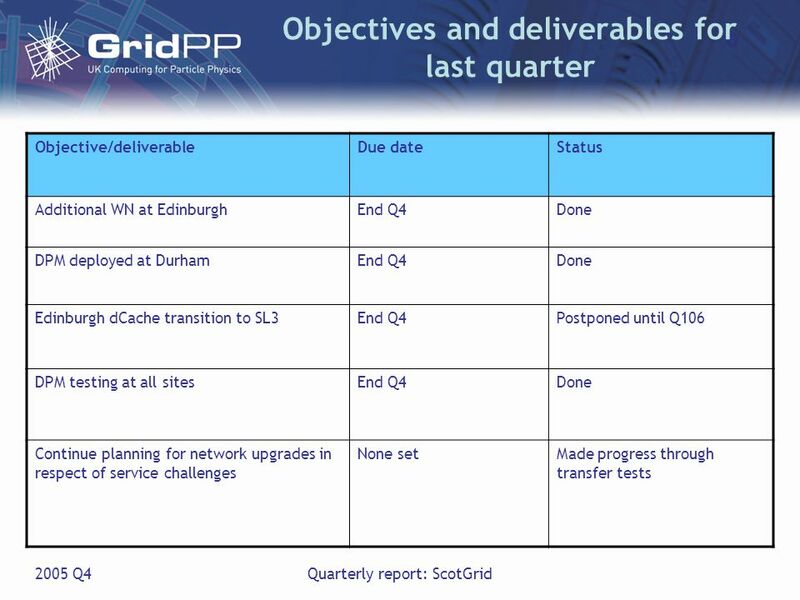 Download ppt "Quarterly report ScotGrid Quarter 04 2005 Fraser Speirs." NorthGrid status Alessandra Forti Gridpp15 RAL, 11 th January 2006. Deployment metrics and planning (aka Potentially the most boring talk this week) GridPP16 Jeremy Coles 27 th June 2006. 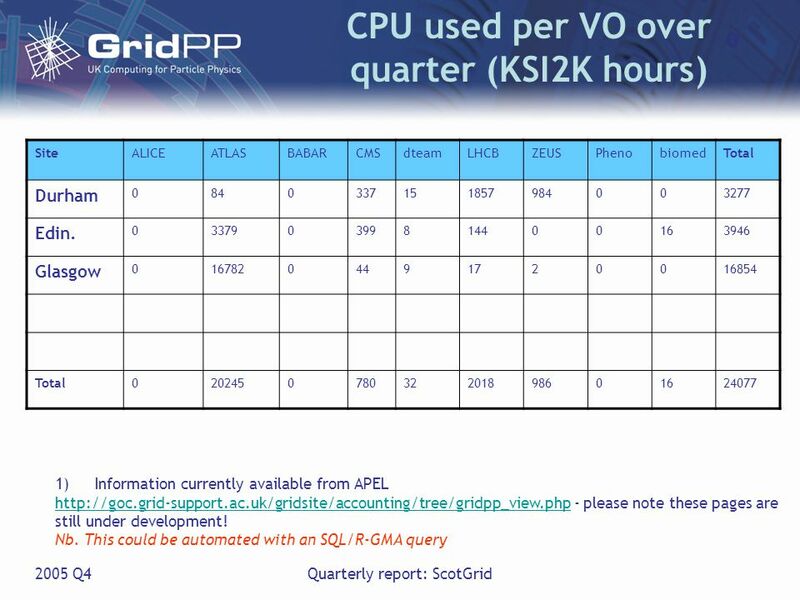 1 ALICE Grid Status David Evans The University of Birmingham GridPP 16 th Collaboration Meeting QMUL June 2006. 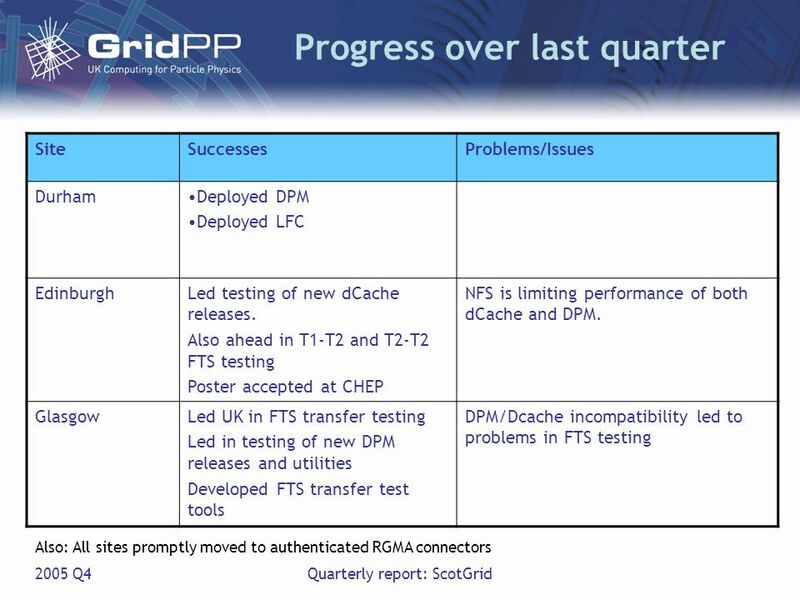 Tony Doyle - University of Glasgow GridPP EDG - UK Contributions Architecture Testbed-1 Network Monitoring Certificates & Security Storage Element R-GMA. Your university or experiment logo here What is it? What is it for? The Grid. SouthGrid Status Pete Gronbech: 12 th March 2008 GridPP 20 Dublin. 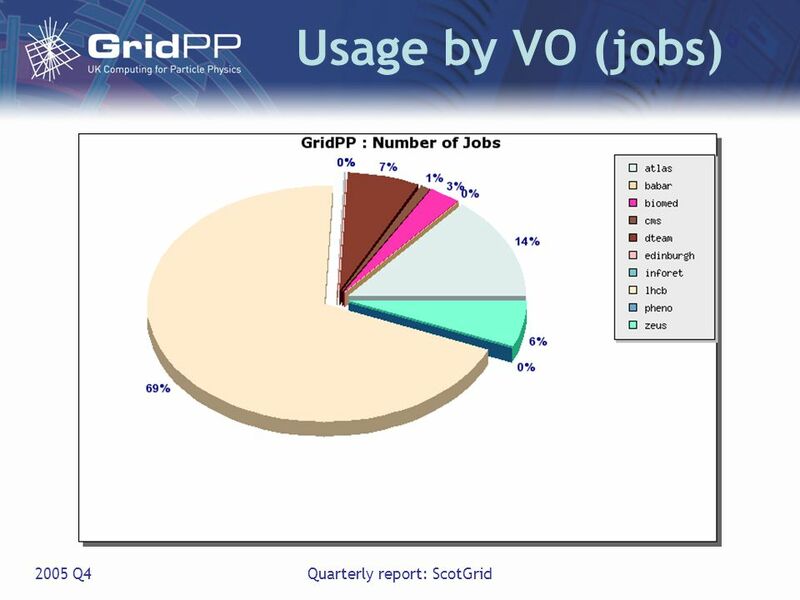 GridPP From Prototype to Production David Britton 21/Sep/06 1.Context – Introduction to GridPP 2.Performance of the GridPP/EGEE/wLCG Grid 3.Some Successes. LCG Tiziana Ferrari - SC3: INFN installation status report 1 Service Challenge Phase 3: Status report Tiziana Ferrari on behalf of the INFN SC team INFN. 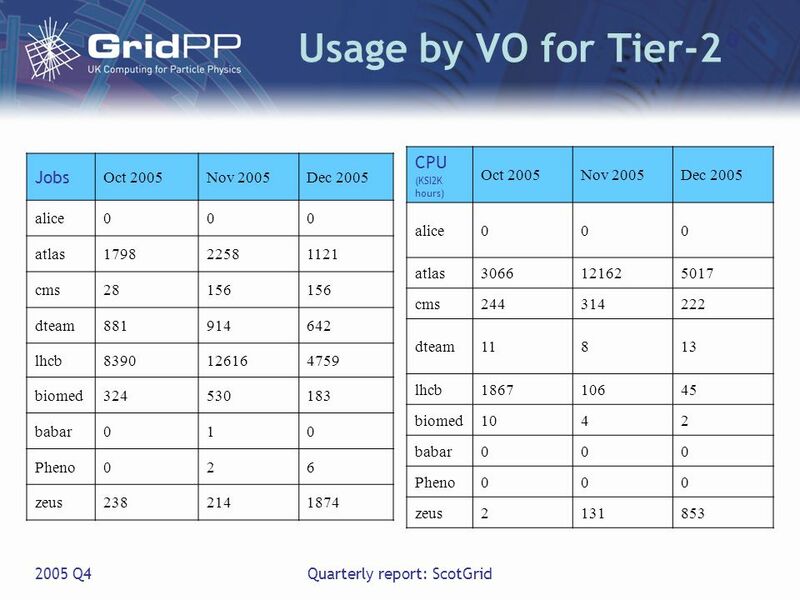 Southgrid Status Pete Gronbech: 27th June 2006 GridPP 16 QMUL. ATLAS computing in Geneva Szymon Gadomski, NDGF meeting, September 2009 S. Gadomski, ”ATLAS computing in Geneva", NDGF, Sept 091 the Geneva ATLAS Tier-3. London Tier 2 Status Report GridPP 13, Durham, 4 th July 2005 Owen Maroney, David Colling. UKI-SouthGrid Overview Face-2-Face Meeting Pete Gronbech SouthGrid Technical Coordinator Oxford June 2013. London Tier 2 Status Report GridPP 12, Brunel, 1 st February 2005 Owen Maroney. LCG Milestones for Deployment, Fabric, & Grid Technology Ian Bird LCG Deployment Area Manager PEB 3-Dec-2002. 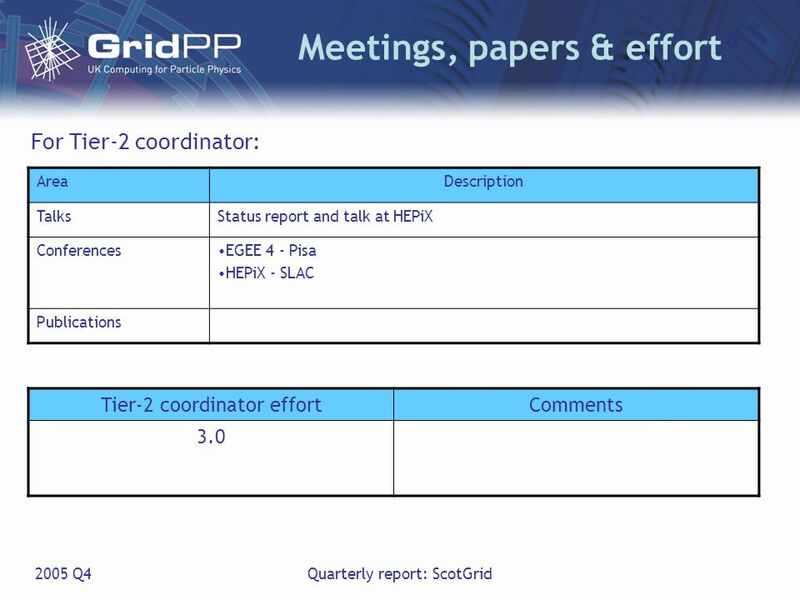 ScotGrid: a Prototype Tier-2 Centre – Steve Thorn, Edinburgh University SCOTGRID: A PROTOTYPE TIER-2 CENTRE Steve Thorn Authors: A. Earl, P. Clark, S.
CMS Report – GridPP Collaboration Meeting VI Peter Hobson, Brunel University30/1/2003 CMS Status and Plans Progress towards GridPP milestones Workload. Quarterly report SouthernTier-2 Quarter P.D. Gronbech. LCG Accounting Update John Gordon, CCLRC-RAL 10/1/2007.